“Let go and let God.” It’s a wonderful thought and a scripturally sound concept. However, it’s easier said than done sometimes. We tend to want to hold on to our problems and stress and worry and agonize over them instead of letting God take care of them for us. We, like small children, want to do it ourselves. Offering a “Let It Go” retreat for your ladies can be a great opportunity to share ways to let go of issues that are beyond their control. It can help them forgive themselves and others for past mistakes. It can also equip them to move forward in faith into God’s promised plan. 13 Brothers, I do not consider myself to have taken hold of it. But one thing I do: Forgetting what is behind and reaching forward to what is ahead, 14 I pursue as my goal the prize promised by God’s heavenly call in Christ Jesus. It’s impossible to move forward if we’re still holding onto and worrying over yesterday’s mistakes. Use this scripture passage to remind your ladies that their goal is ahead of them. We shouldn’t waste valuable time staring back with regret at moments that have already gone. Learn from your mistakes and move on! There is a wise quote that states “Bitterness is like drinking poison and waiting for the other person to die.” Bitterness and resentment in the heart of the believer can fester, leaving that person spiritually sick and depressed. Forgiving is sometimes hard, but it is what is commanded of God’s people. Remind your ladies that they can ask for God’s help to forgive others (and themselves!) and move forward in their lives. 33 But seek first the kingdom of God and His righteousness, and all these things will be provided for you. 34 Therefore don’t worry about tomorrow, because tomorrow will worry about itself. Each day has enough trouble of its own. We could argue that it’s human nature to worry, but God clearly tells us not to do it. He wants His children to live in faithful obedience, knowing that He will take care of them. We can do what we can to avoid trouble, but when it comes we should take our concerns to God and leave them in His very capable hands. This is a super cute, yet meaningful craft for your ladies to make. Using old mint tins, they can make a small, easily portable kit to write down and remember their prayer concerns. Supply the tins and plenty of materials for the ladies to use to decorate them. Include the short poem for the inside lid of the tin. Place a small notepad and pretty pen inside the box to make notes of issues to pray about. Sometimes we need a visual reminder in order to make the choice not to hang on to the wrong things. For this craft, cut out the cross from craft wood or foam board. Allow the ladies to decorate it with stencils and paint. Write the words “Let Go and Let God” on the cross and top it with a pretty, colorful bow. Add wire or hooks to hang it on a door or a wall. This unique craft is designed for children, but it can also be useful for adults. The colorful spinner is a visual representation of prayers being left with God and becoming a beautiful swirl of peace. All you need for this craft are cardstock circles, dot sticker, markers and string. Get your ladies out of their seats and talking with this fun ice-breaker game. Give each lady a sheet of paper and instructions to write down one fact about themselves. They will then crumple the paper into a ball. At your signal, the ladies throw their snowballs around the room, picking up others’ snowballs and throwing them until you call time. When time is up, the ladies will pick up the snowball closest to them and read it out loud. The group must then try to guess which lady the fact is describing. Find out who is full of hot air with this fun Minute-to-Win-It style game. Divide your group into teams and give each lady a balloon. When you give the signal, each lady must blow up her balloon and use the air in it to knock over one of the cups in the line. The team with the most cups knocked over when time runs out wins. This hysterically funny game is sure to be a crowd pleaser. All you need are enough white paper plates and markers for each lady. Instruct the ladies to place the plates on their heads and follow the step-by-step instructions for drawing the snowman on the plates. The lady with the best (or worst) snowman drawing wins. This activity can be done around a bonfire, fireplace or burning barrel. Each lady will write down a list of the things she has been holding on to and stressing over on a piece of paper. At the end of your retreat event, the ladies will throw their lists into the fire as a symbol of letting go and giving their issues to God. This object lesson offers a great visual impact on the concept of letting go of our issues and trusting God in faith. Follow the instructions in the link for cutting and stretching the paper. Be sure to get some courageous volunteers to “step out in faith” so the whole group can see and understand. It’s not always easy to let go. Even when we want to stop agonizing over an issue, we may be reluctant to actually relinquish our perceived control over it. 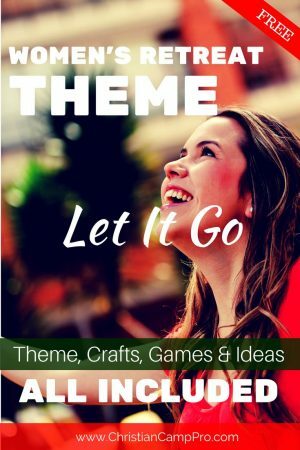 A “Let It Go” retreat can aid in teaching ladies the importance of giving their concerns to God. It can be the first step in them finally moving beyond past mistakes, unforgiveness and crushing anxiety and into the peace of knowing that God can and will take care of them. Special thanks to Eagle Rock Retreat Center for making this article possible.